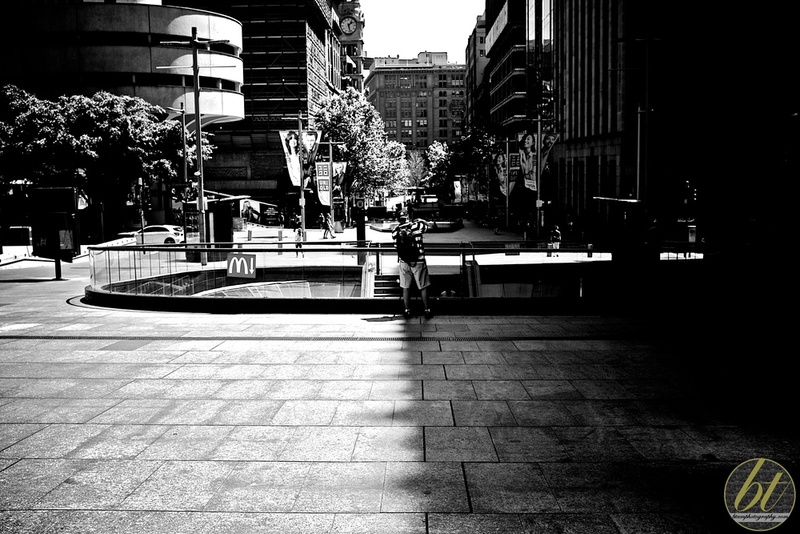 It's not often I get a chance to wander around Sydney's CBD with no time constraints and no plans other than to keep my eyes peeled for interesting photo ops. But when my fiance organised half a day's worth of bridal-related activities, it presented the perfect opportunity to take my Fuji X100S out for a spin! It was challenging to find the right light with the warm spring sun directly overhead and very few clouds in the sky, and no doubt Sydneysiders would tell me that there are far more interesting places to photograph outside of the CBD; but I was more than happy walking around the familiar streets and was hanging out for the obligatory cheap Chinatown lunch! I have to admit I was searching for somewhat contrasty B&W shots (these shots are all edited in post), as I had been somewhat inspired during the week by a vodcast I'd seen on the acclaimed Chinese street photographer Fan Ho (presented by Ted Forbes from The Art of Photography).